There are a wide variety of fun board games for children. Look for a game that meets the age, interests and activity level of your child. Some board games are developed specifically for children. Other games are junior versions of well-loved games designed for teens and adults. 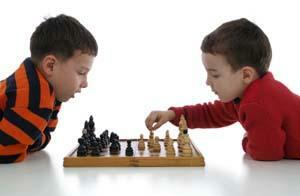 Both types of games can capture a child's attention and imagination. The key is to find a game that would be enough of a challenge to remain interesting to play, but not so difficult that the child will lose interest. Some games are always fun to play, regardless of the occasion or the mood or temperment of the players, but some games are better suited for certain situations. For example, a child may love to play a certain game, but his or her friend might not be as excited about the game and may not enjoy receiving it as a gift. Other gifts are engaging and challenging, but they may not be the best game to teach or reinforce a particular skill like reading or counting. A good rule of thumb when selecting a game is to look for a game that will work well for a variety of ages and when energy levels are low. If the game fits both situations, you have a good chance of picking a great game that most children will enjoy in most situations. I Spy Preschool - Players match riddles with pictures or words. Based on the I Spy books by Jean Marzollo. Ages 36 months to 6 years. Five Little Monkeys Jumping on the Bed - A great introduction to counting, strategy and using motor skills. Based on the award-winning Five Little Monkeys book series by Eileen Christelow. Ages 36 months to 8 years. Candyland - This classic game lets players draw colored cards and move their playing token to the next square with the chosen color. Ages 36 months to 6 years. Chutes and Ladders - Players climb the ladders by doing good deeds. Ages 36 months to 7 years. Chicken Cha Cha Cha - A memory game that requires the players to steal the feather of the other chickens. Quick play time of less than twenty minutes. Ages 4 and up. Trouble - Players pop the bubbles and race their four pegs to the finish line. Ages 5 to 9. Aggravation - Players roll the die and race their marbles around the game board. Ages 6 and up. Cranium - Players move around the board by drawing a card to select one of 14 talents which they have to show to the other players. Ages 13 and up. Chess - Chess rules can be difficult for very small children, but many children enjoy playing this strategy game with other children or with adults. Look for a game with game pieces that are easy to hold based on the players ages. Ages 6 and up. Checkers - The personalities of the players tend to dictate the speed and style of a checkers game. Very young children enjoy the concept of jumping other players, even when the child is too young to understand all the rules of the game. Ages 4 and up. Clue Jr. - This version of the classic Clue game is excellent for all members of the family. Gather clues to solve the mystery! For ages 5 and up. Trivial Pursuit - Kid's Version - This classic trivia game includes questions that are fun for both kids and adults. For ages 8 and up. Apples to Apples Junior - Not really a board game, but a favorite game where players use the 500+ cards to practice their vocabulary and thinking skills to make comparisons. Ages 9 and up. Bible Charades - Teams of players guess charade titles from clues from six categories: Old Testament, New Testament, People and Places, Parables, Proverbs, Hymns and Music. Ages ten and up. Bible Baseball - Players are asked questions by the pitcher, and they "run the bases" if they provide a correct answer. Ages ten and up. Cranium Hullabaloo - Pads of different shapes and colors and pictures are targets for jumping, sliding and standing still. Ages 4 to 10. Twister - This is a great way for individual players or teams to stretch, balance, and reach while standing and sitting on colored patterns on a giant plastic playing mat. Good for indoor or outdoor play. Ages 6 and up. Connect Four Fun on the Run Game - A vertical four-in-a-row checkers game. For ages 7 and up. Scrabble Travel Edition - A mini scrabble game with tight fitting, snap-in tiles that are encased in a zippered case. For ages 8 and up. Operation - Use tweezers to remove parts during the operation without setting off the buzzer. Play alone or with other players. Ages 6 to 12. Perfection - Try to fit all of the 25 different shapes into the correct spots on the pop-up tray game board before the timer runs out of time. Play alone or with other players. Ages 5 and up. Block Head! - Stack the twenty oddly-shaped wooden pieces to new heights. Play alone or with other players. Ages 6 and up. Pictionary - Junior Version - Players draw clues for their team members to use to guess the name of a person, phrase, book, song, movie etc. Ages 7 and up. A to Z Junior - Players try to name as many items that start with different letters and then cover the first letter of the words that were named. The game sharpens vocabulary, verbal skills and memory. Ages 5 and up. Sorry! - This is a classic game of luck and strategy where players move their pieces around the board trying to reach home before any other players. Ages 6 and up. Battleship - Two players of any age can look for their opponent's ships by calling out the squares on the grid, plan their attack and sink the enemy's fleet. For ages 7 and up. When shopping for board games for children, be sure to look for the games that best meet the interests and abilities of the children who will be playing them. Review the new games as well as the classics.